Salt Lake City rejects Kavanaugh! | Fight Back! 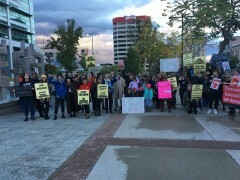 Salt Lake City protest against Kavanaugh. Speakers from SDS, Rose Park Brown Berets, Freedom Road Socialist Organizations, Party for Socialism and Liberation, and Utah Against Police Brutality rallied the crowd to fight against Kavanaugh's confirmation. Attendees also committed to "flooding the streets" if Kavanaugh is confirmed. A coalition of organizations have already committed to this mobilization.